This is the BEST Instant Pot ribs recipe out there. You’ll never make ribs another way again. When I came up with my dutch oven ribs recipe earlier this summer, I thought I’d found my go-to ribs recipe. Well, sorry, dutch oven…I have a new favorite now. Instant Pot BBQ Ribs…yes, you can make ribs in the Instant Pot, and yes, they are incredibly easy and amazing. I looked around on the Internet at different recipes, and I took bits and pieces of advice from each one to come up with this recipe…which I think is the best one around. For this recipe, I used four pounds of spare ribs that I had bought on sale at King Soopers awhile back and frozen. I will say, they just barely fit in my Instant Pot, but they were cooked perfectly all the way through. If you want your ribs to be falling-off-the-bone tender, you will want to cook them around 25 minutes – maybe a little less if you aren’t using four pounds like I am. I know that other cuts of ribs require a little less time, so if you aren’t using spare ribs, you may want to research how long. And fortunately for anyone reading this…I’ve got you covered. I start out by covering the ribs in some dijon mustard. I don’t see tons of recipes that recommend this, but when I was doing research for my dutch oven ribs a few months ago, it seemed that the experts said a thin layer of mustard is essential. Then, I covered them in a delicious, homemade spice rub. Chances are, you’ll have all the ingredients in your cupboard already. After that, I had to come up with a liquid to cook it in. When you are using the Instant Pot, you have to have about a cup of liquid in it, especially when you are cooking with this much meat. I came up with one that I think is pretty amazing. And finally – you need to the perfect BBQ sauce. You don’t want to dose it in BBQ sauce afterward, and you also don’t want it to be super thick. If your BBQ sauce is thick, you can try and thin it up with a little bit of vinegar. I went with a memphis BBQ sauce we had bought at King Soopers awhile back, and it worked perfectly. These ribs are done in less than an hour, and they are absolutely amazing. I highly recommend making these, because they are pretty full proof. They don’t require much babysitting, and the result is to die for. 1 teaspoon smoked paprika regular paprika is fine, too. Combine together spice rub ingredients. Cover ribs with the spice rub. Place the Instant Pot liquid in the bottom of the pot. Add the trivet to the pot. Put lid on and set IP to 25 minutes of high manual pressure. Once the timer is done, let it release it's pressure naturally for 10 minutes, and then use the pressure valve to let it quick pressure release the rest. Get out a baking sheet and cover it with tin foil or a silicone baking mat. Place ribs on the baking sheet. Cover with a layer of cover bbq sauce. Can I do 2 racks? Maybe adjust the temp? Hi, Linda! What pot do you have? Just getting started on recipes for the IP. 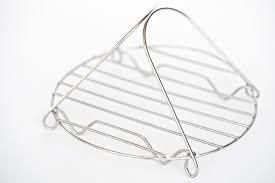 I am wondering trivet. all i have is the steam rack that sits almost to the top. no trivet for lower. Can I just wrapp the ribs and let them stand up with one end in the fluid. Were the ribs still frozen or did you thaw them out prior? 1. Under Spice Rub, you say 1 tsp “basi”, do you mean dried basil? 2. Under Liquid, you list the ingredients and say Dr. Pepper. Can I use a coke or pepsi instead? Also, the last ingredient under liquid to be added to the pot, is BBQ sauce. How much? Or, do you mean it’s saved to slather on the ribs after cooking, and before broiling? I know it’s a confusing concept! It’s mainly for the flavor to infuse into them through the steam – if you want, you could totally marinade the meat in that mixture beforehand, and then just pour it in – might give it just a touch more flavor 🙂 Glad your hubby loved them! Great question! Man, all these instant pot recipes you post make me want to get one!